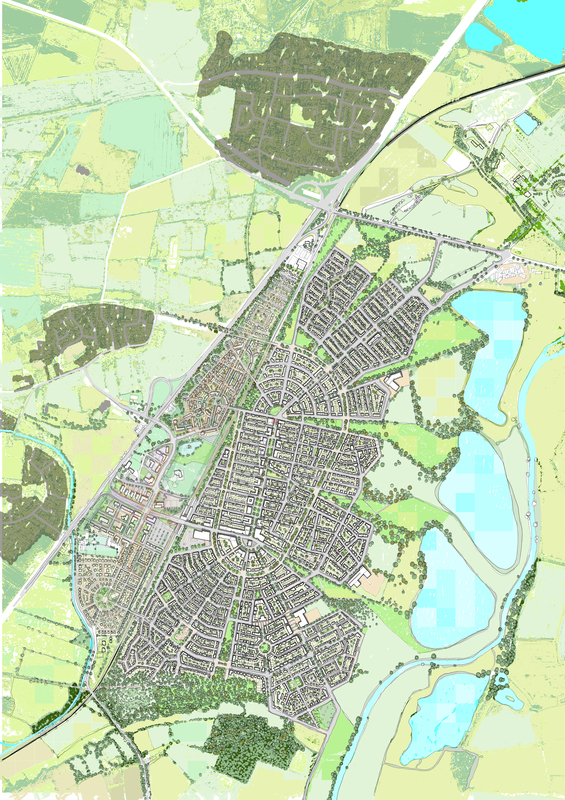 URBED were appointed by Barratt Developments in January 2015 to develop a masterplan for the Brookhay site, located between Lichfield and Burton upon Trent in Staffordshire. The site is in two parts and covers an enormous 847ha, bisected by two railway lines and accessible from the A38. Much of the land had previously been, or was currently being, used for mineral working. The scale of the site and its excellent connectivity presented an opportunity to develop a new community designed around Garden City principles. Working as part of a team which included Wardell Armstrong, IPaD and Mick Timpson Urban Design, URBED undertook an initial masterplanning exercise, creating two linked masterplans for the two sections of the site. The northern section, Brookhay Waterside, focused business-led mixed use development around a state of the art watersports centre. To the south, Brookhay Garden Village created a new community of 7500 new homes with a high street, schools, shops and service set within 220ha of open space.